There wasn’t an NBA lifer who didn’t allow himself the fantasy of trading places with the coach of Maccabi Tel Aviv. A replacement ref had ejected him from a charity exhibition with the New York Knicks, and still Pini Gershon wouldn’t leave the floor. Minutes passed, and nothing. He wouldn’t leave. There’s nothing you can do to me, a witness heard the coach bark. 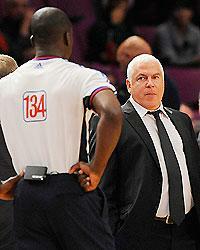 It took 10 minutes for Pini Gershon to leave the court following his ejection. “I don’t work for the NBA,” he reminded them. Behind the bench, the Maccabi president was livid. He was sitting with the former Israeli Prime Minister and angered that his club had paid more than $500,000 to make this Madison Square Garden game its own on Sunday. Maccabi controlled the tickets and sold thousands to raise money for an Israeli orphanage. “This is how you treat us?” the team official yelled to frazzled NBA executives in the stands. Mostly, he screamed to get NBA commissioner David Stern on the phone, a witness said. Yes, this behavior would’ve bought an NBA coach and GM the wrath of Emperor Stern, but Maccabi had international immunity. So, these replacements refs were no longer damaging the credibility of the NBA, but threatening an international basketball incident. To throw out a coach in a charity game at the Garden was a needless move, especially when an NBA-employed witness insists that Gershon’s griping didn’t merit a second technical foul and ejection. This was one of those games where officials needed to understand time and place and circumstances. In that way, these crews are lost causes. As much as anything, that’s the criticism of these lockout refs from the Developmental League and WNBA: They have no sense for the speed and skill and athleticism of the NBA. Thus, the whistles never stop blowing. They hesitate on the obvious and tweet on the bizarre. The games are a traffic pileup of starts and stops, sluggish and unwatchable. There’s no flow, no rhythm. All along, everyone believed the NBA and the referee’s union would reach an agreement before opening night. The two sides are close on every important issue in negotiations and the pressure’s on Stern to finish a deal. The refs miss the paychecks, but the veteran officials own the leverage now. Opening night with replacement refs will be a disaster for the NBA, an unrelenting storyline. To think that the commissioner would run the risk of allowing one of these crews to officiate Boston-Cleveland next Tuesday night, well, it’s downright disturbing. Yes, it’s on the officials that they have twice backed away from apparent deals in these negotiations, but this can’t go on. Since the Tim Donaghy scandal, officiating has been the issue that Stern can’t escape. It keeps coming and coming for him. The rest of the officials had privately been worried over a “tell-all” book Donaghy had been shopping to publishing houses, but apparently the project is dead. One referee believed the book would include embarrassing personal revelations on the rank-and-file referees, but clearly Donaghy’s inventory of credible information had run dry. Ever since Donaghy, the league has had a crisis of credibility on officiating. Truth be told, it didn’t start with his gambling scandal. All that did was exacerbate it. Around the NBA, this preseason of officiating has raised issues on the league’s feeder system. Of course there are some good young refs on the rise, but enough? “I know it’s a real tough job, but the year that I moved up from the D-League to the Sixers I was shocked – I mean, shocked – to see some of the refs from the previous year that were doing the same,” said Jeff Ruland, who had been the coach of the Albuquerque T-Birds in 2007-08 before a promotion to the Philadelphia 76ers a year later. The NBA started the preseason with ominous reminders to its teams to stay quiet about the officiating. There have been several significant fines handed down to coaches – including $60,000 for Charlotte’s Larry Brown – for running down the replacement refs this month. Mostly, the players have been smarter and refuse to let themselves get fined for games that don’t count. Nevertheless, the examination of games changes immensely next week and the NBA is running out of time to spare itself significant embarrassment. They’re risking the physical and mental state of their most valuable commodity – the league’s players – by prolonging these negotiations. Perhaps it took the stubborn Maccabi coach with nothing to lose to remind everyone these refs are ultimately unacceptable, that an NBA season that starts with replacement refs is no start to the season at all.